Tandem bicycles are specially designed for two people to ride and since both riders push pedals to move the bike forward, it becomes easier to travel longer journeys. Tandem bikes are a bit expensive than the conventional ones but you can use your creative skills to construct such a bike at home. 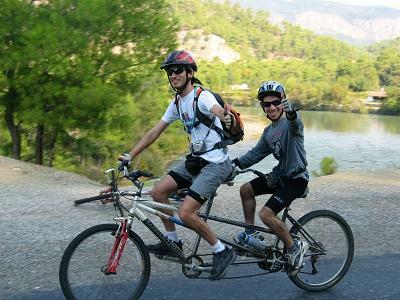 You will require few tools and accessories for converting a conventional bicycle into a tandem bike. This will cost you far less than purchasing a readymade tandem bicycle from the market. You will need two bicycles to form a tandem. Begin with selecting two bikes for making your tandem bicycle. Prefer to choose the bikes with thicker frames, as they are stronger, durable and fit for the purpose. Then you have to consider the size of the riders who are to mount the tandem bike. If one of the riders is larger than the other one, you will have to choose the two bikes according to their respective size. The larger bike will be placed at the front of the tandem and smaller one at the rear. Cut the front half of the head tube at the rear of the bike and then the front seat stays from the seat tube. Also cut out the fork end of the bike. You can use a hacksaw for this purpose and when done. Sand and file the cut ends of the bicycle frame until all the paint is brushed off it and bare metal is exposed. Now carefully bend the front chain up and in, filing the fork’s surface at the same time to ensure they both perfectly fit into position at the rear down tube. Roughly put together the frames and clamp them with vise grips. The rear frame’s head tube is to be fixed around the front frame’s seat tube. Make sure the drop out is tightly touching the down tube. Affix the wheels in their proper place. It is preferred to use the wheels of a mountain bike, rather than conventional street bike’s. Double check the alignment of the two bikes, as it is extremely vital for the entire process. You have to weld the two bike frames together and if you have no experience of brazing, it is better to contact a professional. Next you have to install brakes on the front, as well as the rear bike. You will need two chains to set up for your tandem bike. One chain shall connect the crank set to the rear wheel, while the other one will bond the bottom brackets. Put in the chain rings of the same size, as this will reduce the stress on the chain and the frame. You can also use old derailleurs to adjust the tension in the chain and line them up with the chain rings. In the end, attach a handlebar for the seatpost stem for the rear rider.